Every refrigerated topping rail features a stainless steel design that is not only durable but also easy to clean. 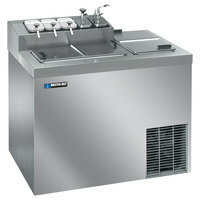 Additionally, their fully-insulated designs ensure temperature retention to keep your ice cream and toppings chilled. 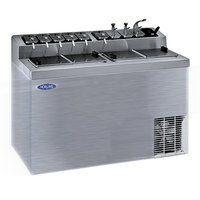 It’s also convenient that each ice cream topping rail features a flip- top lid that makes it easy for users to scoop out ice cream and then add toppings without having to walk to another unit. 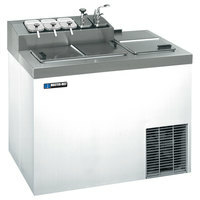 Also make sure to check out other great items from Master-Bilt and Nor-Lake. 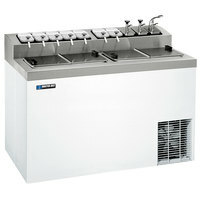 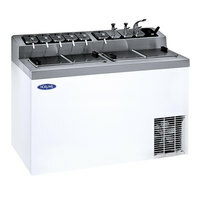 plusMaster-Bilt FLR-80 White Flip Top Ice Cream Dipping Cabinet with Topping Rail - 54"
plusMaster-Bilt FLR-80SE Stainless Steel Flip Top Ice Cream Dipping Cabinet with Topping Rail - 54"
Master-Bilt FLR-60SE Stainless Steel Finish Flip Top Ice Cream Dipping Cabinet with Topping Rail - 43"
plusMaster-Bilt FLR-60 White Flip Top Ice Cream Dipping Cabinet with Topping Rail - 43"
By having a refrigerated topping rail, you’ll have everything you need to make delicious ice cream sundaes and other treats in one compact location. 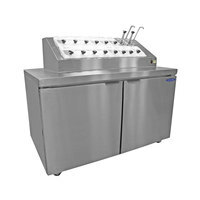 Whether you’re looking for a smaller unit for your low-volume establishment or a larger one for your busy ice cream parlor, we have you covered. 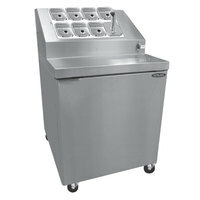 You can even find models on casters that can be easily moved if you decide to rearrange your serving station. While you’re shopping for essential supplies for your ice cream shop, be sure to check out our soft serve ice cream mix, waffle cone supplies, and ice cream toppings. 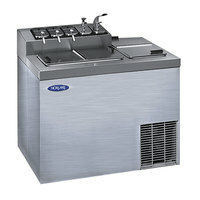 If you're wondering where to buy refrigerated ice cream topping rails, we have a large selection of refrigerated ice cream topping rails for sale at the lowest prices.